Are we on our way to bionic replacement organs? British scientists have just successfully implanted a bionic eye for the first time, allowing an 80-year-old legally blind man to see the world around him with a video camera. 80-year-old Ray Flynn suffers from an age-related condition called macular degeneration, which caused him to lose his central vision in one eye. He can still see out of the periphery of his eye, but there’s a large black hole in the center of his vision that has grown over the years. There is no treatment for this condition, but using the bionic implant, he can now see obstacles in front of him using special video glasses. 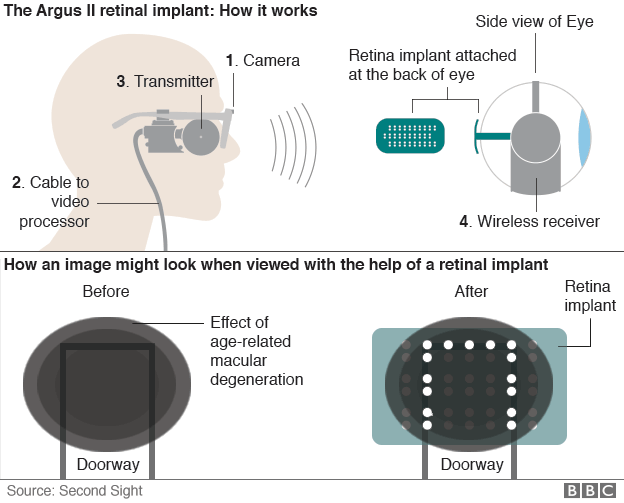 The implant, called the Argus II, consists of a transmitter that’s attached directly to the eye using electrodes. Images from a miniature video camera mounted on special glasses transmit images in the form of electrical pulses to the electrodes, which in turn stimulate the remaining cells in the retina to send the information to the brain. In a test two weeks after the surgery, Flynn could detect horizontal and vertical lines on a computer. The implant even allows him to see with his eyes closed, as the doctors had him close his eyes during the test in order to ensure the information was coming from the camera. Flynn has already begun to return to activities that require his central sight, such as gardening and watching television. Over time, Stanga claims, Flynn should get accustomed to the implant and be able to interpret the images sent to his brain more clearly, so he can see almost exactly what the video camera is seeing. This technology could have enormous impact on the quality of life for people with macular degeneration, and while the technology is specific to forms of sight loss that leave some healthy retinal cells, the successful implant of a bionic eye, or a bionic organ in general, is a major breakthrough. For better and for worse (but mostly for better) this could be the beginning of a whole new landscape for medical treatment. Once we start fusing organic bodily functions with machines, we’ll be on the road towards turning the humans of the future into full-fledged cyborgs. If we could create other bionic organs, like bionic hearts, lungs, and kidneys, then we could extend the human lifespan by many, many years.